When I see something that looks delicious I have to make it, even if I’ve never tasted it. Risky, I know. This was my experience with Cioppino. I was hosting a dinner and decided to make the seafood soup dish that attracted my attention at some of my favorite restaurants. The name Cioppino comes from ciuppin, a word in the Ligurian dialect of the port city of Genoa, Italy meaning “to chop” or “chopped”. It is considered an Italian-American dish that originated in San Francisco and is related to various fish soups and stews of Italian Cuisine. It describes the process of making a stew by chopping up various leftovers of the day’s catch. The end result was outstanding. I fell in love instantaneously and my family and friends have raved about this dish ever since. There are a number of reasons why this dish is perfect for entertaining. You can make the soup base ahead of time. The longer it simmers, the more flavorful and rich it will taste. When your guests arrive and just before serving you simply add in the seafood and within minutes the Cioppino is ready to serve. You can use a variety of your favorite seafood, whether it be shellfish (mussels, clams, oysters, crab legs) or firm fleshed fish, which I prefer (halibut, sea bass, shrimp, scallops, salmon). You get to cook with your favorite bottle of dry white wine! Your friends and family will give you big hugs and kisses. Now, for the finishing touch. Cioppino is typically served with toasted bread, either sourdough or baguette. I suggest using slices of toasted baguette for this recipe and generously spreading my Roasted Red Pepper Garlic Spread. It’s a must and it takes the dish from fantastic to WOW! If you’ve had Cioppino before, this recipe has few spices and a rich base. Since my first taste, I have tried many versions, all of which are wonderful. This is one elegant meal that you will not forget! 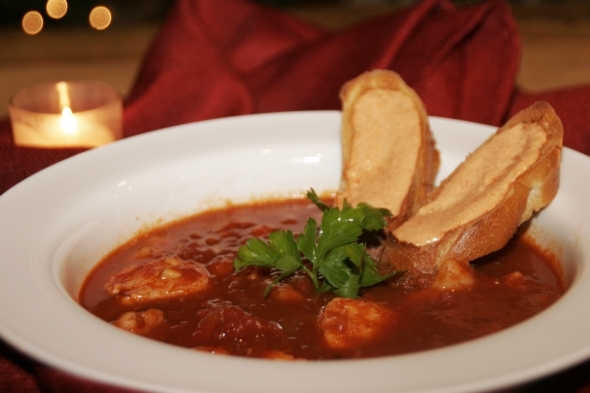 Cioppino is a wonderful seafood soup to serve for any dinner occasion. The secret to a good cioppino is to use good quality ingredients and to simmer the base for several hours before serving. I serve it with slices of toasted baguette bread topped with a Roasted Red Pepper and Garlic Spread. Heat the olive oil in a large cast iron or other large pot over medium heat. Add the onion, fennel, shallots and salt and saute until translucent, about 10 minutes. Add the garlic and red pepper flakes and saute another 2 minutes. Add tomato paste and saute for one minute. Add tomatoes with their juices, white wine, fish stock, and bay leaves. Cover and bring to a boil then simmer (partially covered) on medium heat for 1 hour, stirring occasionally. *Onions, fennel, shallots and garlic may be chopped one day ahead and refrigerated. All fish may be cleaned, cut and refrigerated one day ahead as well.